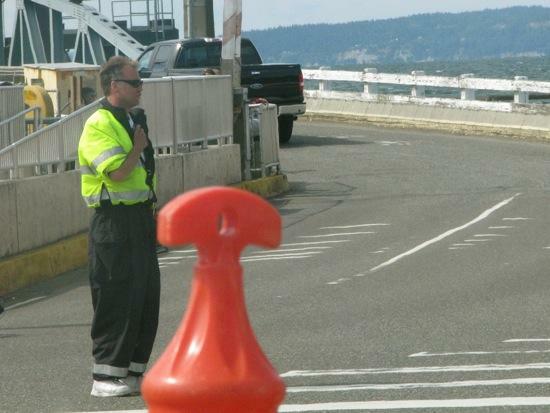 What Happens When a Washington State Ferry (WSF) Employee is Injured? When an employee is injured on the job in Washington State, they are covered under the Washington Industrial Insurance Act (Chapter 51.12 RCW) and other state workers’ compensation laws. Alternatively, ferry employees who work on vessels are covered under the federal Jones Act law. In 1920, the Jones Act was passed, allowing sailors who were injured on the job to sue their employer for damages sustained. This law evolved with the perceptive that employers had certain responsibilities towards their employees. Furthermore, the law continued to morph to deem sailors “wards of the court” and found that employers had a duty to provide for their medical costs other damages. Maintenance and Cure: If an employee is injured or becomes ill while in the service of the vessel he is entitled to be paid maintenance and cure until he is recovered or “maximum cure.” Maintenance is the cost of daily living expense set by a collective bargaining agreement and cure is the cost of medical treatment. Jones Act Negligence: This is a claim based on demonstrating that the employer was negligent, which had a causal connection to the injury. Not Seaworthy: This theory is based on a “breach of warranty” theory of fault. A vessel deemed not seaworthy can mean a variety of things, including a slippery deck or equipment that was not reasonable safe for its intended purpose. Negligence is not a factor when judging if the vessel was not seaworthy. 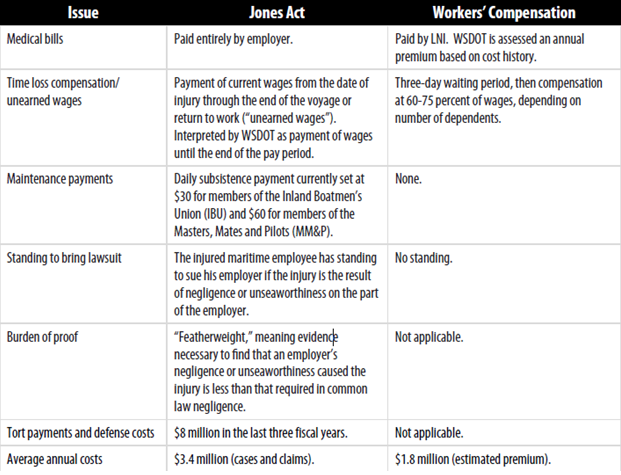 The table below shows the differences in coverage between the Jones Act and Washington State workers’ compensation. Although the average settlement may be greater in Jones Act claims versus workers’ compensation claims, each type of coverage has its pros and cons. For example, if you are injured on a vessel while on the job and are covered by workers’ compensation insurance, your medical bills and a portion of your wage lost will be cover immediately. Conversely, if you are covered under the Jones Act, you will receive maintenance payments and wage lost. However, workers’ compensation allows employees to be covered without the burden of proving negligence or non-seaworthiness. Although the burden in Jones Act cases in less than required than in common law negligence cases, it still requires that the injured party demonstrate the injury was caused by the fault of the employer. Without being able to prove this, the injured party has no standing to bring a lawsuit. Washington State is one of many states that have waived its sovereign immunity in allowing Washington State Ferry Employees to bring a lawsuit against them on the theory of negligence or unseaworthiness. Approximately 60 percent of Washington State Ferry employees are employed on vessels and therefore receive benefits under the Jones Act and general maritime laws. The remaining 40 percent are employees which receive benefits under the Washington States industrial insurance program. Because crewman are constantly exposed to high risk of being injured on the job, it is important for these types of employees to understand their legal options and the types of benefits that they are entitled to. In most cases, Washington State Ferry employees who are injured on the vessel recover significantly greater compensation than employees who are not covered under the Jones Act. Led by attorney Chris Davis, the Davis Law Group has represented accident victims in Washington state for more than 20 years. If you or a loved one would like to have your case confidentially reviewed by an experienced personal injury lawyer, contact Davis Law Group, P.S. today at 206-727-4000.